Bangkok (Thailand) – July 18, 2018 (travelindex.com) – Winners of the 2018 PATA Grand and Gold Awards are announced today by the Pacific Asia Travel Association (PATA). These awards, generously supported and sponsored since 1995 by the Macao Government Tourism Office (MGTO), this year recognise the achievements of 27 separate organisations and individuals. The awards ceremony takes place in Langkawi, Malaysia on Friday, September 14 during PATA Travel Mart 2018. 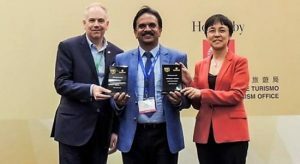 The 34 Grand and Gold Awards will be presented to such organisations as Amadeus Asia Limited, Thailand; AirAsia, Malaysia; Department of Culture and Tourism Abu Dhabi, UAE; Hong Kong Tourism Board; Jetwing Hotels Ltd, Sri Lanka; Kerala Tourism, India; Local Alike, Thailand; Marianas Visitors Authority; Melco Resorts and Entertainment, Macao; PEAK DMC, India; and Tourism Authority of Thailand. This year’s awards attracted 200 entries from 87 organisations and individuals worldwide. The winners were selected by an independent judging committee consisting of fourteen senior executives from the travel, tourism and hospitality sectors (see full list below). The PATA Grand Awards are presented to outstanding entries in four principal categories: Marketing; Education and Training; Environment, and Heritage and Culture. The Tourism Authority of Thailand (TAT) will receive the 2018 PATA Grand Award for Education and Training for its ‘King’s Wisdom for Sustainable Tourism’ project, a collaboration between the Tourism Authority of Thailand and the United Nations Development Program (UNDP) Thailand. It uses the principles of His Majesty the Late King Bhumibol Adulyadej’s “sufficiency economy philosophy” in its work towards four primary objectives: to be able to continue working on the king’s principle to restore local wisdom and promote sustainable tourism, stimulate domestic tourism, create value in the tourist areas in order to increase revenue, and promote human resources development and strengthen the community to think and do by themselves leading to sustainable development. The Environmental award will be presented to Elephant Hills Luxury Tented Camps, Thailand for their various activities including its Elephant Conservation Project, Children’s Project, and Wildlife Monitoring Project. They also organise a smaller project called CO2 offset which allows them to seek ways of reducing their carbon footprint. The Heritage and Culture Award will be awarded to the Hong Kong Tourism Board for its ‘Art is Everywhere’ project. Two talented artists collaborated on the photography project, which showcased the hidden art gems in Hong Kong. The project was the first time for an Asian destination organisation to initiate a photography project which was designed to focus on promoting art scenes, collaborate with a US photographer and professional dancers for social media promotion, and raise awareness of Arts month and local cultural hubs, creating conversations on social media among local and international art lovers. The Marketing Award will also be presented to the Hong Kong Tourism Board for its ‘Hong Kong Neighbourhoods: Old Town Central’ campaign. To raise awareness and encourage visitors to explore the dynamic district of Central and Sheung Wan, the Hong Kong Tourism Board repackaged the area into ‘Old Town Central (OTC)’. Instead of creating an advertising campaign to talk about OTC, they created an immersive experience by featuring the characteristics of the area and developed a strategic model to guide travellers all the way from ‘I have never heard of Old Town Central’ to ‘I enjoy walking around Old Town Central’ with the ultimate goal of inviting them to go deeper into the area and learn something new about Hong Kong. Mr. Abdulla Ghiyas, Deputy Managing Director, Inner Maldives Holidays, Maldives; Mr. Benjamin Ping-Yao Liao, Chairman, Forte Hotel Group, Chinese Taipei; Dr. Joby Thomas, Associate Professor, School of Business Studies and Social Sciences, Christ University, India; Mrs. Margaret Wilson, Managing Director, C-MW Management, Australia; Mr. Matthew Zatto, Vice President of Tourism, ADARA, Australia; Ms Natasha Martin, Managing Director, Bannikin Asia, Hong Kong SAR; Mr. Nicholas Yeap, VP, Sales & Marketing, FLEXIROAM Sdn. Bhd., Malaysia; Mr. Nobutaka Ishikure, Chairman, Goltz et ses amis, Japan; Mr. Paul Pasquale, Content Manager, Red Robot Communications (Asia) Pte Ltd, Singapore; Mr. Peter Semone, Founder and President, Destination Human Capital Limited, Ireland; Mr. Randy Durband, CEO, Global Sustainable Tourism Council (GSTC), Thailand; Ms. Samantha Hague, General Manager, Red Robot Communications (Asia) Pte Ltd, Singapore; Ms Stephanie A Wells, MSc. Co-Chair School of Tourism Management, Capilano University, Canada, and Mr. Soon-Hwa Wong, Founder and CEO, Asia Tourism Consulting Pte Ltd, Singapore.